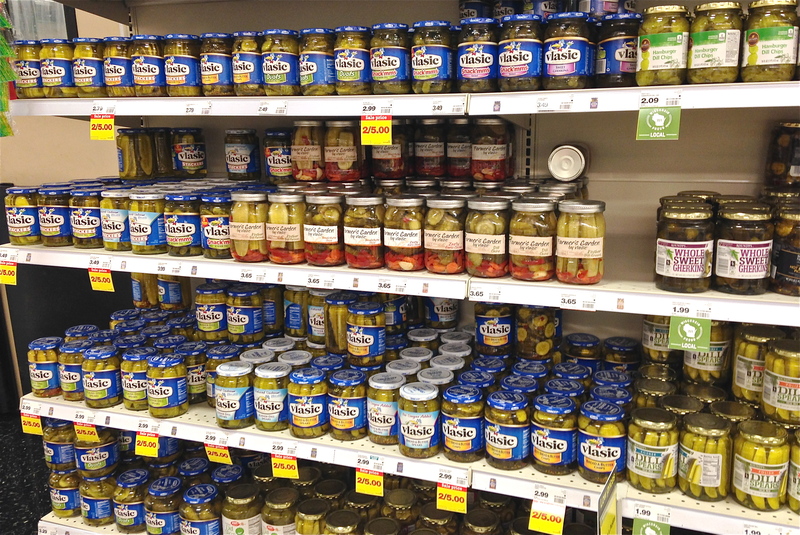 As I regularly pass by the wall of pickle products, I am always caught by the impact of the Farmer’s Garden® by Vlasic® pickles package and its ability to stand out from a wall of blue – especially since the blue packaging it stands apart from is its sister line of Vlasic products. I have no issue with Vlasic packaging, it is clean, bright and it succeeds in drawing the eye to the shelf in a category where there are too many choices. That’s why I like the Farmer’s Garden package – the product is the absolute hero of the package – and in this instance – is the packaging! There is nothing new or revolutionary about pickles in glass jars. I should note that there are a significant number of pickle products that do not cover the interior contents with labels – in fact, this is the one category that fully displays package content. The only reason you need to read a package is if you have a question on flavoring. But somehow the content of the Farmer’s Garden product isn’t the universal pickle yellow or visually blurry dark green but it is bright, festive and fresh looking. 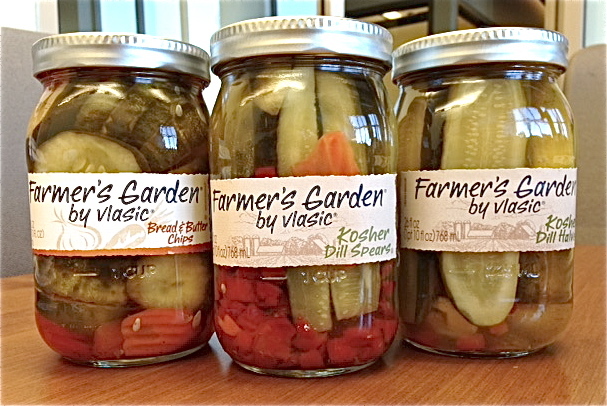 It is apparent that for the Farmer’s Garden line, Vlasic has focused on the fresh look and feel of the product in the jar as the key component in communicating with the consumer. Letting go of a conventional jar label, the Farmer’s Garden jar is finished with a simple brown kraft paper label that mimic’s a farmers market or home canned style of label; it portrays the feeling this is a handcrafted product. This is reinforced by the jar, which is similar to a square-sided canning jar and home canning lid, giving it a larger physical presence on shelf. The label design is complete with only a minimal amount of content – the brand name, product style, and net content. This is a great example of putting a product on shelf and turning packaging “givens” into assets. The package says clean, the product implies honest, real and fresh as opposed to mass-produced – and yet this is mass-produced. The content is apparent and immediate – the consumer doesn’t have to search to uncover mysterious cues about product specifics or content. They have taken an ordinary garden variety jar (no pun intended) and created packaging that succeeds in catching and setting a mood, quickly and effectively and delivering a “package” that is universally understandable.